Zen (Chinese: 禪) is a school of Mahayana Buddhism that originated in China during the Tang dynasty as Chan Buddhism. Zen school was strongly influenced by Taoism and developed as a distinguished school of Chinese Buddhism. From China, Chan Buddhism spread south to Vietnam, northeast to Korea and east to Japan, where it became known as Japanese Zen. Click on individual pictures or links to display large and high resolution images. The Flower Sermon is a story of the origin of Zen Buddhism in which Śākyamuni Buddha (Siddhartha Gautama) transmits direct prajñā (wisdom) to the disciple Mahākāśyapa. In the original Sino-Japanese, the story is Nengemishō (拈華微笑, literally "Pick up flower, subtle smile"). The story of the Flower Sermon appears to have been created by Chinese Chán Buddhists. The earliest known version of the tale appeared in 1036. I possess the true Dharma eye, the marvelous mind of Nirvana, the true form of the formless, the subtle Dharma Gate that does not rest on words or letters but is a special transmission outside of the scriptures. This I entrust to Mahākāśyapa. 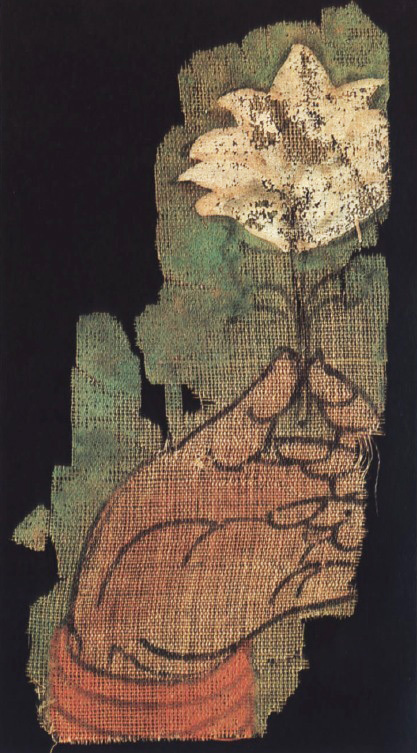 This small fragment of a painting on silk shows a hand holding a white-and-pink flower delicately between thumb and forefinger, against a green background. Image source and Reference: archive.org "Along the Ancient Silk Routes: Central Asian Art from the West Berlin State Museums" by Härtel, Herbert, and Marianne Yaldiz. Page 192. Image-Cataloque No. 132. Mahakasyapa smiling at the lotus flower. View the video at youtube.com English subtitle. Bodhidharma (Sanskrit: बोधिधर्म Chinese 菩提達摩, Japanese ダルマ), was a legendary Buddhist monk who lived during the fifth and sixth century C.E. and played a seminal role in the transmission of Zen Buddhism from India to China (where it is known as Chan). He is considered by Zen Buddhists to be the twenty-eighth Patriarch in a lineage that is traced directly back to Gautama Buddha himself. Bodhidharma is also credited with founding the famous Shaolin school of Chinese martial arts and is known as a Tripitaka Dharma Master. In Japan, he is known as Daruma. Bodhidharma's teachings and practice centered on meditation and the Laṅkāvatāra Sūtra. "The Anthology of the Patriarchal Hall" (952) identifies Bodhidharma as the 28th Patriarch of Buddhism in an uninterrupted line that extends all the way back to the Gautama Buddha himself. His teachings point to a direct experience of Buddha-Nature rather than an intellectual understanding of it, and he is best known for his terse style that infuriated some (such as Emperor Wu of Liang), while leading others to enlightenment. His life and teachings continue to be an inspiration to practitioners of Zen Buddhism today, and he exemplifies hard work, discipline and determination on the path to spiritual realization. The stanza, in fact, is not Bodhidharma's, but rather dates to the year 1108. According to the principal Chinese sources, Bodhidharma came from the Western Regions, which refers to Central Asia but may also include the Indian subcontinent, and was either a "Persian Central Asian" or a "South Indian [...] the third son of a great Indian king." 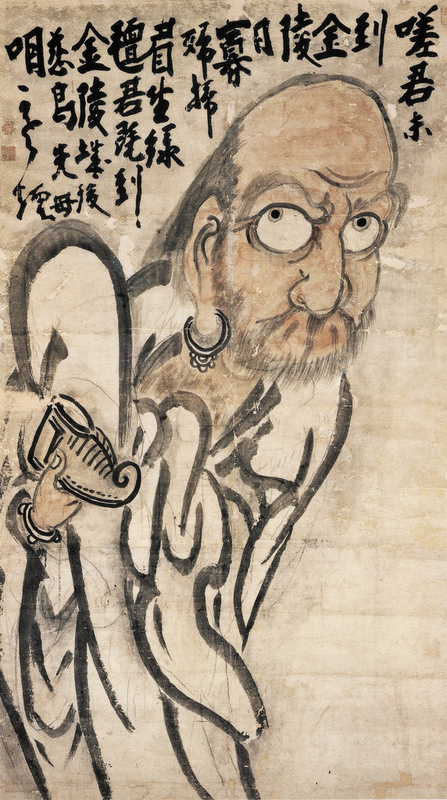 Throughout Buddhist art, Bodhidharma is depicted as an ill-tempered, profusely-bearded, wide-eyed non-Chinese person. He is referred as "The Blue-Eyed Barbarian" (Chinese: 碧眼胡) in Chan texts. Aside from the Chinese accounts, several popular traditions also exist regarding Bodhidharma's origins. The accounts also differ on the date of his arrival, with one early account claiming that he arrived during the Liú Sòng Dynasty (420–479) and later accounts dating his arrival to the Liáng Dynasty (502–557). 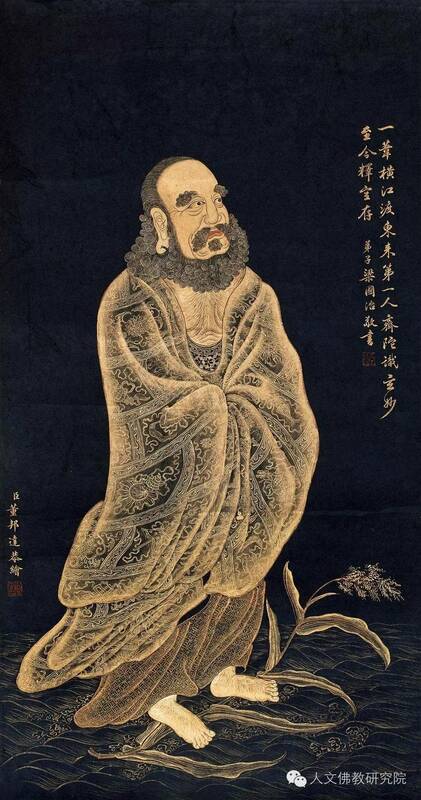 Bodhidharma was primarily active in the territory of the Northern Wei (386-634). Modern scholarship dates him to about the early 5th century. Details concerning Bodhidharma's biography are unclear because major sources of information about his life are inconsistent with regard to his origins, the chronology of his journey to China, his death, and other details. There are two primary sources from the contemporaries of Bodhidharma. The later accounts for biographical information on Bodhidharma are layered with mythical legends. The two most commonly cited sets of Bodhidharma's dates are 440–528 C.E. and 470–543 C.E. It is said that Bodhidharma was born to an upper-caste family (either a Brahmin or a Kshatrya) in India. However, he left his high social status to pursue a life of renunciation and became a follower of Mahayana Buddhism under the twenty-seventh Patriarch Prajnatara, from whom he received the mind-to-mind transmission of enlightenment that is still a defining feature of the Zen tradition. With Prajnatara's permission to transmit the Dharma to others, Bodhidharma left India to reinvigorate Buddhism in China. According to traditional accounts, Bodhidharma’s journey to China is said to have taken three years by boat. His most famous encounter in China was with the Emperor Wu of Liang, who was a strong supporter of Buddhism. The Emperor asked him how much merit all of his donations to the building of temples, printing of scriptures, and supporting of the Sangha (Buddhist community) had accumulated for him, to which Bodhidharma replied, “no merit at all.” This surprising answer is commonly explained by the view that because the Emperor was doing these deeds for his own benefit and not for the good of others, he was acting out of selfishness, and therefore deserved no merit at all. The Emperor then asked Bodhidharma, “what is the highest meaning of the holy truths?” to which he replied, “empty, without holiness,” a reference to the Mahayana doctrine of emptiness (shunyata). The Emperor, now exasperated, asks Bodhidharma “who are you?” Bodhidharma enigmatically responds, “I don’t know” (Cleary and Cleary 1992, 1). This confrontation with Emperor Wu is paradigmatic of both the style and relationship between master and disciple in Zen, and illustrates its distinctive tradition of koans (this episode is the first koan in the Blue Cliff Record). The goal of the Mahayana path is bring about insight in followers of their inherent Buddha-nature. Bodhidharma’s distinctive style of achieving this goal of awakening was not gentle and incremental, but jarring and immediate, like a bucket of cold water being thrown over ordinary everyday thinking. After this short encounter, Bodhidharma was expelled from the court and traveled further north, crossing the Yangtze River. He stopped at the Shaolin temple at Mt. Song but was refused entry, and is said to have subsequently sat in meditation outside the monastery facing its walls (or in a nearby cave in other accounts) for nine years. The monks were so impressed with his dedication to his zazen that he was finally granted entry. This episode elucidates a central theme of Zen practice: the almost exclusive value placed on zazen (sitting meditation) and the resulting self-realization. Once inside, he was dismayed by how weak and tired the Shaolin monks had become from their studying and meditation without any physical labor. To rectify the situation, he is said to have instituted a set of exercises for the monks to promote their physical health. As a result, Bodhidharma is said to have created the foundation of many schools of Chinese martial arts. The cause and age of his death are unclear. One story recounts how two teachers, jealous of his renown, tried to poison him on several occasions. After their sixth attempt, he decided that, having successfully spread his teaching to China, it was time for him to pass into parinirvana. He is said to have died soon after sitting in zazen. This is the earliest text mentioned Bodhidharma, compiled in 547, by Yáng Xuànzhī (Yang-Hsuan-chih 楊衒之), a writer and translator of Mahāyāna Buddhist texts into the Chinese Language. At that Time there was a Monk of the Western Region named Bodhidharma, a Persian Central Asian. He traveled from the wild borderlands to China. Seeing the golden disks on the pole on top of Yǒngníng's Stupa, reflecting in the sun, the rays of Light illuminating the surface of the clouds, the jewel-bells on the Stupa blowing in the wind, the echoes reverberating beyond the heavens, he sang its praises. He exclaimed: "Truly this is the work of Spirits." He said: "I am 150 years old, and I have passed through numerous countries. There is virtually no country I have not visited. Even the distant Buddha-realms lack this." He chanted homage and placed his palms together in salutation for days on end. The Dharma Master was a South Indian of the Western Region. He was the third son of a great Indian king. His ambition lay in the Mahayana Path, and so he put aside his white layman's robe for the black robe of a Monk [...] Lamenting the decline of the true teaching in the outlands, he subsequently crossed distant mountains and seas, traveling about propagating the teaching in Han and Wei. 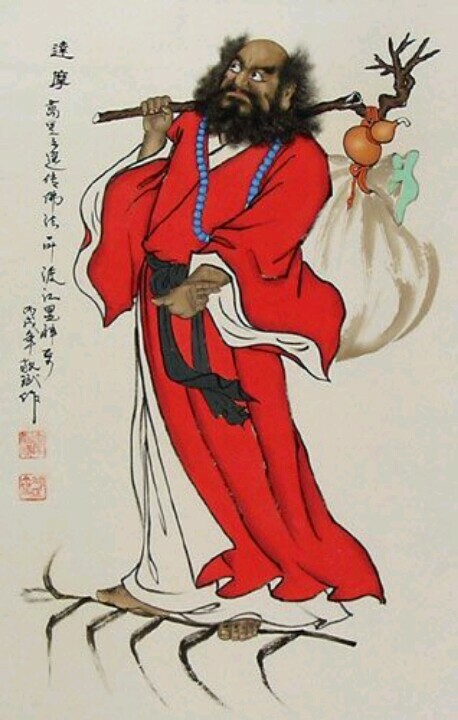 T'an-lín's account was the first to mention that Bodhidharma attracted disciples, specifically mentioning Dàoyù (道育) and Huìkě (慧可), the latter would figure very prominently in the Bodhidharma literature. T'an-lín has traditionally been considered a Disciple of Bodhidharma,it is more likely that he was a student of Huìkě. Firstly, Dàoxuān adds more detail concerning Bodhidharma's origins, Writing that he was of "South Indian Brahman stock" (南天竺婆羅門種). Secondly, more detail is provided concerning Bodhidharma's journeys. 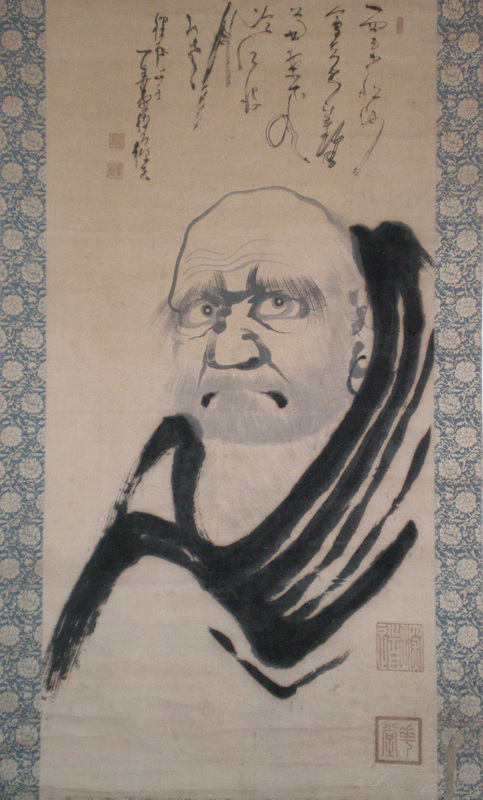 Dàoxuān implies that Bodhidharma first arrived at Nan-yüeh during the Sung period. From there he turned north and came to the Kingdom of Wei". This implies that Bodhidharma had travelled to China by sea, and that he had crossed over the Yangtze River. Thirdly, Dàoxuān suggests a date for Bodhidharma's arrival in China. He writes that Bodhidharma makes landfall in the Time of the Song, thus making his arrival no later than the Time of the Song's fall to the Southern Qi Dynasty in 479. Finally, Dàoxuān provides Information concerning Bodhidharma's Death. Bodhidharma, he writes, died at the banks of the Luo River, where he was interred by his Disciple Huike, possibly in a cave. According to Dàoxuān's chronology, Bodhidharma's Death must have occurred prior to 534, the date of the Northern Wei Dynasty's fall, because Huike subsequently leaves Luoyang for Ye. Furthermore, citing the shore of the Luo River as the place of Death might possibly suggest that Bodhidharma died in the mass executions at Heyin 河陰 in 528. Supporting this possibility is a report in the Taishō shinshū daizōkyō stating that a Buddhist monk was among the victims at Héyīn. In the “Anthology of the Patriarchal Hall”, the elements of the traditional Bodhidharma story are in place. Bodhidharma is said to have been a Disciple of Prajñātāra, thus establishing the latter as the 27th Patriarch in India. After a three-year journey, Bodhidharma reaches China in 527 during the Liang Dynasty (as opposed to the Song period of the 5th century, as in Dàoxuān). Finally, as opposed to Daoxuan's figure of "over 150 years," the Anthology of the Patriarchal Hall states that Bodhidharma died at the age of 150. He was then buried on Mount Xiong'er (熊耳山 Xióngĕr Shān) to the west of Luoyang. Insofar as, according to the Anthology of the Patriarchal Hall, Bodhidharma left the Liang court in 527 and relocated to Mount Song near Luoyang and the Shaolin Monastery, where he "faced a wall for nine years, not speaking for the entire time", his date of Death can have been no earlier than 536. Moreover, his encounter with the Wei official indicates a date of Death no later than 554, three years before the fall of the Later Wei kingdom. it is stated that Bodhidharma's original Name had been Bodhitāra but was changed by his master Prajñātāra. The same account is given by the Japanese master Keizan's 13th century work of the same title. 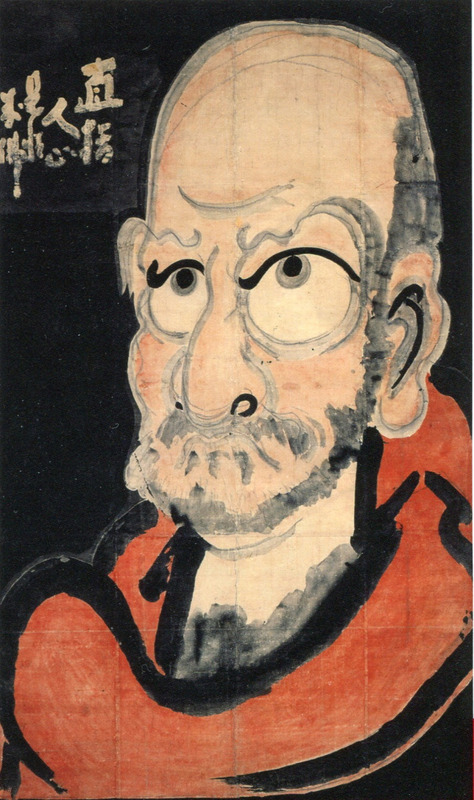 Despite his revered status as the 28th Chan Patriarch, Bodhidharma is commonly depicted in Buddhist art as a rather ill tempered, profusely bearded and wide-eyed barbarian (he is described as "The Blue-Eyed Barbarian" in Chinese texts). These ill-tempered portrayals are perhaps partly due to Bodhidharma's disdain for conventions and his overturning of societal expectations. Several legends are associated with Bodhidharma, notably his role in founding Chinese martial arts, introducing tea to China, and the alleged paralysis of his legs from stillness, which is still seen in the Japanese cultural practice of making Daruma dolls. 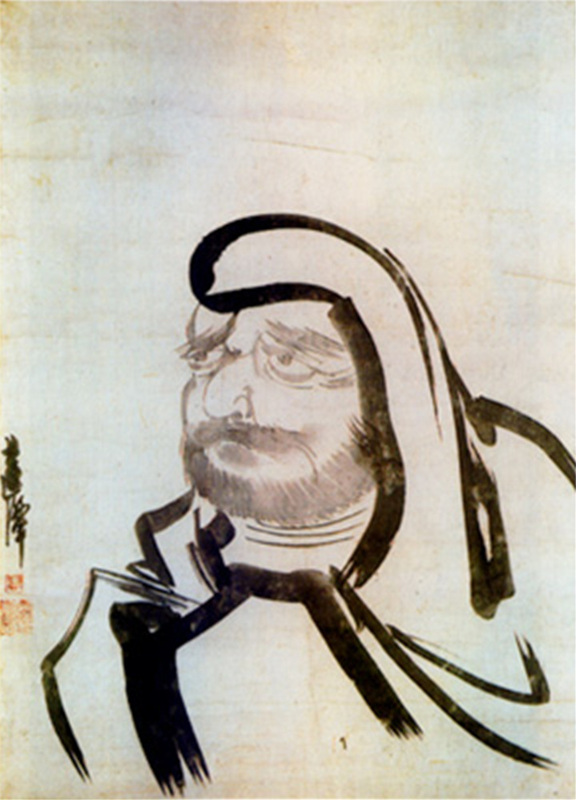 Hakuin Ekaku 白隠慧鶴 (1685-1768) was one of the most influential figures in Japanese Zen Buddhism. He is regarded as the reviver of the Rinzai school from a moribund period of stagnation, refocusing it on its traditionally rigorous training methods integrating meditation and koan practice. 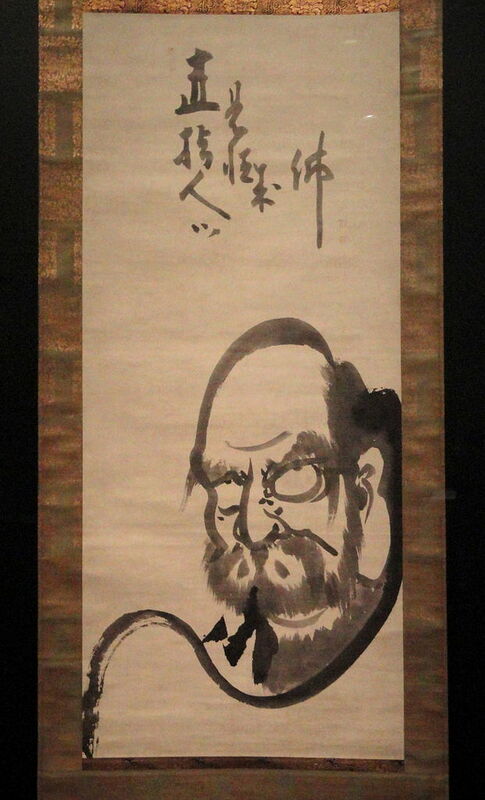 Left: This Japanese scroll calligraphy of Bodhidharma reads “直指人心，見性成佛”(from up to down, left to right) “Zen points directly to the human heart (mind), seeing the real nature [is] becoming Buddha”. Left: Daruma by Shunsō Shōshu (1752-1835), Edo period, ink on paper, Cincinnati Art Museum. 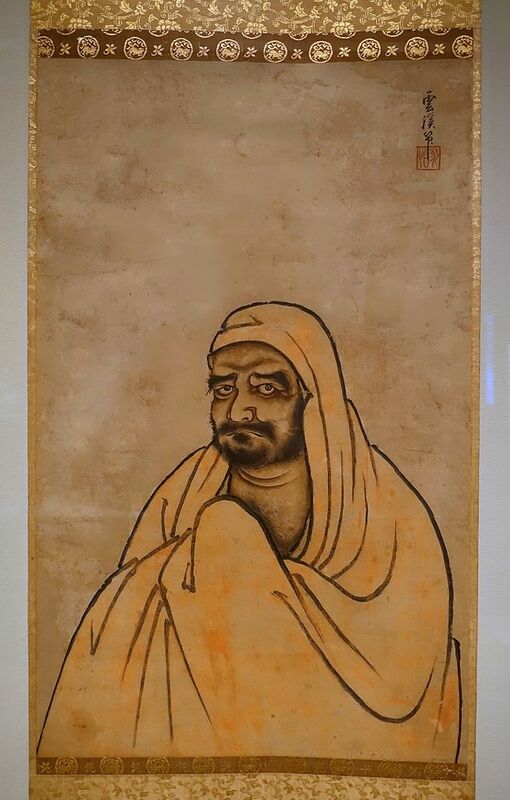 Middle Left: Bodhidharma by Unkei Ikkei, Japan, 1504-1520 AD, ink on paper - Linden-Museum - Stuttgart, Germany. Right: Daruma, anonymus painter, japanese hanging scroll, late edo- era, collection seemann berlin. 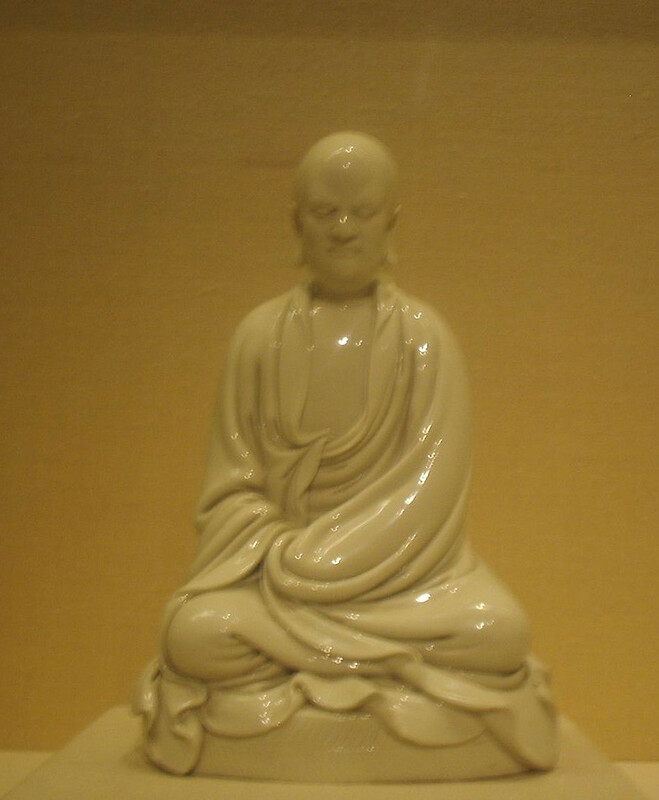 A porcelain statuette of Chan Patriarch Bodhidharma at The Metropolitan Museum of Art. Dehua porcelain (德化陶瓷)) is a type of white Chinese porcelain, made at Dehua in the Fujian province. Shaolin monks and disciples follow a unique practice among Buddhists in that they greet each other using only their right hand. This greeting is a tradition which dates back to Da Mo and his disciple, Hui Ke. In 495 AD, the Indian monk Ba Tuo, or Buddhabhadra, came to China teaching a form of Buddhism known as Xiao Sheng Buddhism. He was given land at the foot of Shaoshi mountain by Emperor Shao Wen and founded the Shaolin Temple on this land. Around the time that Ba Tuo was founding the Shaolin Temple there was an Indian prince named Bodhidharma. Bodhidharma was very intelligent and was the favorite son of the king of a region that is now part of southern India. Bodhidharma had two older brothers who feared that their father, the king, would pass them over and bequeath the kingship to Bodhidharma. In their jealousy, the two older brothers often disparaged Bodhidharma while talking with their father, hoping to turn him against their younger brother. The older brothers also attempted to assassinate Bodhidharma but Bodhidharma had very good karma and so the attempts were not successful. Despite being the favorite son of the king, Bodhidharma realized that he was not interested in a life of politics. He chose instead to study with the famous Buddhist master Prajnatara and become a Buddhist monk. Bodhidharma trained with his master for many years. One day he asked his master, "Master, when you pass away, where should I go? What should I do?" His master replied that he should go to Zhen Dan, which was the name for China at that time. Years later, Bodhidharma's master passed away and Bodhidharma prepared to leave for China. During the many years that Bodhidharma had studied as a monk, one of his older brothers had become king of India and that older brother's son had become king after him. The king of India was very fond of his uncle and wanted to make amends for the actions which Bodhidharma's older brothers had taken against him. He asked Bodhidharma to stay near the capital, where he could protect and care for him, but Bodhidharma knew that he must go to China as his master had said. Seeing that Bodhidharma would not remain, the king of India ordered that carrier pigeons be sent to China with messages asking the people of China to take care of Bodhidharma. These messages made Bodhidharma famous among many Chinese who wondered what was so special about this particular Buddhist monk that the king of India would make such a request. In 527 AD, 32 years after Ba Tuo's founding of the Shaolin temple, Bodhidharma crossed through Guangdong province into China. In China, he was known as Da Mo. Da Mo arrived in China practicing Da Sheng (Mahayana) Buddhism. When Da Mo arrived, he was greeted by a large crowd of people who had heard of the famous Buddhist master and wished to hear him speak. Rather than speak, Da Mo sat down and began meditating. He meditated for many hours. Upon completing his meditation, Da Mo rose and walked away, saying nothing. His actions had a profound effect upon his audience. Some people laughed, some cried, some were angry and some nodded their heads in understanding. Regardless of the emotion, everyone in the crowd had a reaction. This incident made Da Mo even more famous, so famous that Emperor Wu heard of him. Emperor Wu, who ruled over the southern kingdom of China, invited Da Mo to come to his palace. When Da Mo arrived, Emperor Wu talked with Da Mo about Buddhism. The emperor had erected many statues and temples devoted to Buddhism. He had given much wealth to Buddhist temples. In talking of his accomplishments, Emperor Wu asked Da Mo if his actions were good. Da Mo replied that they were not. This response surprised Emperor Wu, but they continued talking and eventually Emperor Wu asked Da Mo if there was Buddha in this world. Da Mo replied that there was not. Da Mo's replies were a reflection of Emperor Wu. By asking if his actions were good, Emperor Wu was searching for compliments and affirmation from Da Mo. Da Mo denied that Emperor Wu's actions were good because it is the duty of the emperor to care for his people. Rather than seeking compliments, Emperor Wu should have been content to help his people through Buddha. Similarly, if one asks if there is Buddha in the world, then one has already answered the question: Buddha is a matter of faith, you either believe in your heart or you do not. In questioning the existence of Buddha, Emperor Wu had demonstrated a lack of faith. Da Mo's answers enraged Emperor Wu and he ordered Da Mo to leave his palace and never return. Da Mo simply smiled, turned and left. Da Mo continued his journey, heading north, when he reached the city of Nanjing. In the city of Nanjing, there was a famous place called the Flower Rain Pavillion where many people gathered to speak and relax. There was a large crowd of people gathered in the Flower Rain Pavillion around a Buddhist monk, who was lecturing. This Buddhist monk was named Shen Guang. Shen Guang had at one time been a famous general. He had killed many people in battle but one day realized that the people he had been killing had family and friends and that one day someone might come and kill him. This changed him and he decided to train as a Buddhist monk. Eventually, Shen Guang became a great speaker on Buddhism. As Da Mo neared the crowd, he listened to Shen Guang's speech. Sometimes Shen Guang would speak and Da Mo would nod his head, as if in agreement. Sometimes Shen Guang would speak and Da Mo would shake his head, as if in disagreement. As this continued, Shen Guang became very angry at the strange foreign monk who dared to disagree with him in front of this crowd. In anger, Shen Guang took the Buddhist beads from around his neck and flicked them at Da Mo. The beads struck Da Mo in his face, knocking out two of his front teeth. Da Mo immediately began bleeding. Shen Guang expected a confrontation; instead, Da Mo smiled, turned and walked away. This reaction astounded Shen Guang, who began following after Da Mo. Da Mo continued north until he reached the Yangzi river. Seated by the river there was an old woman with a large bundle of reeds next to her. Da Mo walked up to the old woman and asked her if he might have a reed. She replied that he might. Da Mo took a single reed, placed it upon the surface of the Yangzi river and stepped onto the reed. He was carried across the Yangzi river by the force of his chi. Seeing this, Shen Guang ran up to where the old woman sat and grabbed a handful of reeds without asking. 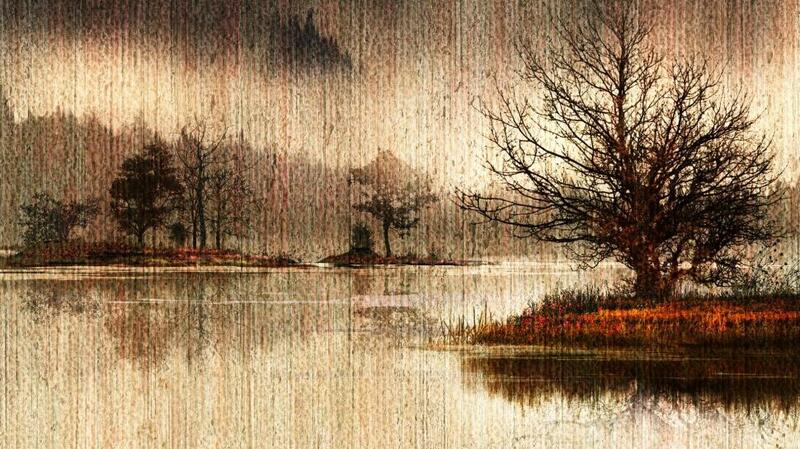 He threw the reeds onto the Yangzi river and stepped onto them. The reeds sank beneath him and Shen Guang began drowning. The old woman saw his plight and took pity on Shen Guang, pulling him from the river. As Shen Guang lay on the ground coughing up river water, the old woman admonished him. She said that by not asking for her reeds before taking them, he had shown her disrespect and that by disrespecting her, Shen Guang had disrespected himself. The old woman also told Shen Guang that he had been searching for a master and that Da Mo, the man he was following, was that master. As she said this, the reeds which had sunk beneath Shen Guang rose again to the surface of the river and Shen Guang found himself on the reeds being carried across the Yangzi river. He reached the other side and continued following after Da Mo. There are many people who believe that the old woman by the river was a Boddhisatva who was helping Shen Guang to end the cycle of his samsara. At this point, Da Mo was nearing the location of the Shaolin Temple. The Shaolin monks had heard of his approach and were gathered to meet him. When Da Mo arrived, the Shaolin monks greeted him and invited him to come stay at the temple. Da Mo did not reply but he went to a cave on a mountain behind the Shaolin Temple, sat down, and began meditating. In front of the Shaolin Temple, there are five mountains: Bell Mountain, Drum Mountain, Sword Mountain, Stamp Mountain and Flag Mountain. These mountains are named after the objects which their shape resembles. Behind the Shaolin Temple there are five "Breast Mountains" which are shaped like breasts. The cave in which Da Mo chose to meditate was on one of the Breast Mountains. Da Mo sat facing a wall in the cave and meditated for nine years. During these nine years, Shen Guang stayed outside Da Mo's cave and acted as a bodyguard for Da Mo, ensuring that no harm came to Da Mo. Periodically Shen Guang would ask Da Mo to teach him, but Da Mo never responded to Shen Guang's requests. During these nine years the Shaolin monks would also periodically invite Da Mo to come down to the Temple, where he would be much more comfortable, but Da Mo never responded. After some time, Da Mo's concentration became so intense that his image was engraved into the stone of the wall before him. Towards the end of the nine years, the Shaolin monks decided that they must do something more for Da Mo and so they made a special room for him. They called this room the Da Mo Ting. When this room was completed at the end of the nine years, the Shaolin monks invited Da Mo to come stay in the room. Da Mo did not respond but he stood up, walked down to the room, sat down, and immediately began meditating. Shen Guang followed Da Mo to the Shaolin temple and stood guard outside Da Mo's room. Da Mo meditated in his room for another four years. Shen Guang would occasionally ask Da Mo to teach him, but Da Mo never responded. At the end of the four-year period Shen Guang had been following Da Mo for thirteen years, but Da Mo had never said anything to Shen Guang. It was winter when the four-year period was ending and Shen Guang was standing in the snow outside the window to Da Mo's room. He was cold and became very angry. He picked up a large block of snow and ice and hurled it into Da Mo's room. The snow and ice made a loud noise as it broke inside Da Mo's room. This noise awoke Da Mo from his meditation and he looked at Shen Guang. In anger and frustration Shen Guang demanded to know when Da Mo would teach him. Da Mo responded that he would teach Shen Guang when red snow fell from the sky. Hearing this, something inside Shen Guang's heart changed and he took the sword he carried from his belt and cut off his left arm. He held the severed arm above his head and whirled it around. The blood from the arm froze in the cold air and fell like red snow. Seeing this, Da Mo agreed to teach Shen Guang. Da Mo took a monk's spade and went with Shen Guang to the Drum Mountain in front of Shaolin Temple. The Drum Mountain is so called because it is very flat on top. Da Mo's unspoken message to Shen Guang was that Shen Guang should flatten his heart, just like the surface of the Drum Mountain. On this Drum Mountain Da Mo dug a well. The water of this well was bitter. Da Mo then left Shen Guang on the Drum Mountain. For an entire year, Shen Guang used the bitter water of the well to take care of all of his needs. He used it to cook, to clean, to bathe, to do everything. At the end of the first year, Shen Guang went down to Da Mo and again asked Da Mo to teach him. Da Mo returned with Shen Guang to the Drum Mountain and dug a second well. The water of this well was spicy. For an entire year, Shen Guang used the spicy water for all of his needs. At the end of the second year, Shen Guang went back down to Da Mo and asked again to be taught. Da Mo dug a third well on the Drum Mountain. The water of this third well was sour. For the third year, Shen Guang used the sour water for all of his needs. At the end of the third year, Shen Guang returned to Da Mo and agains asked to be taught. Da Mo returned to the Drum Mountain and dug a fourth and final well. The water of this well was sweet. At this point, Shen Guang realized that the four wells represented his life. Like the wells, his life would sometimes be bitter, sometimes sour, sometimes spicy and sometimes sweet. Each of these phases in his life was equally beautiful and necessary, just as each of the four seasons of the year is beautiful and necessary in its own way. Without really saying many words to Shen Guang, Da Mo had taught Shen Guang the most important of lessons in a mind-to-mind, heart-to-heart fashion. This mind-to- mind, heart-to-heart communication is called "action language" and is the foundation of the Chan Buddhism which Da Mo began at the Shaolin Temple. After his realization, Shen Guang was given the name Hui Ke and he became abbot of the Shaolin temple after Da Mo. To pay respect for the sacrifice which Hui Ke made, disciples and monks of the Shaolin Temple greet each other using only their right hand. Emperor Wu: "How much karmic Merit have I earned for ordaining Buddhist Monks, building Monasteries, having Sutras copied, and commissioning Buddha images?" 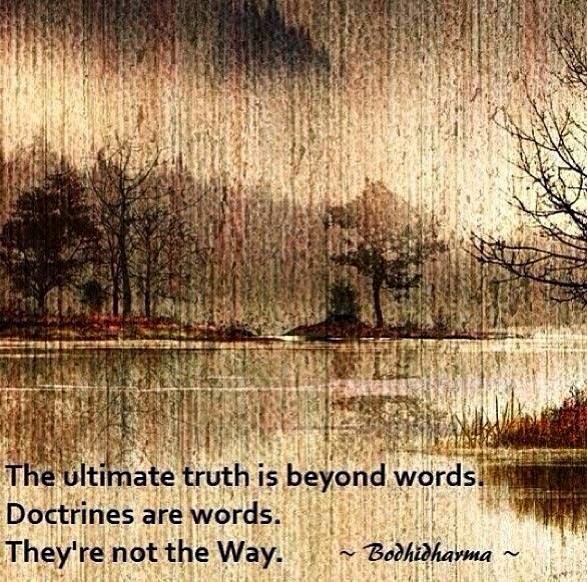 Bodhidharma: "None. Good deeds done with worldly intent bring good Karma, but no Merit." Emperor Wu: "So what is the highest meaning of Noble Truth?" Bodhidharma: "There is no Noble Truth, there is only void." Emperor Wu: "Then, who is standing before me?" Bodhidharma: "I know not, Your Majesty." After Bodhidharma left, the Emperor asked the official in charge of the Imperial Annals about the encounter. The Official of the Annals then asked the Emperor if he still denied knowing who Bodhidharma was. When the Emperor said he didn't know, the Official said, "This was the Great-being Guanyin (i.e., the Bodhisattva Avalokiteśvara) transmitting the imprint of The Buddha's Heart-mind." The Emperor regretted his having let Bodhidharma leave and was going to dispatch a messenger to go and beg Bodhidharma to return. The Official then said, "Your Highness, do not say to send out a messenger to go fetch him. The people of the entire nation could go, and he still would not return." This encounter was included as the first Kōan of the koan-collection The Blue Cliff Record. Middle Right: Bodhidharma Crossing the Yangzi River on a Reed, Painted by Kano Sōshū (Japanese, 1551–1601), Momoyama period, late 16th century, Japan, hanging scroll; ink on paper, image: 31 3/4 x 12 3/4 in. (80.6 x 32.4 cm), Metropolitan Museum of Art. 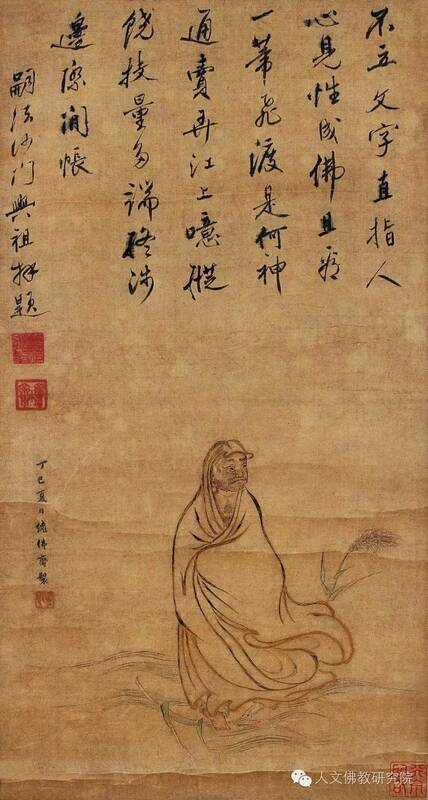 Right: Bodhidharma Crossing the Yangzi River on a Reed (Date:before 1317) Painted by Li Yaofu (Chinese 李堯夫, active ca. 1300), Yuan dynasty (1271–1368), Hanging scroll; ink on paper. Dimensions:Image: 33 3/4 × 13 5/16 in. (85.7 × 33.8 cm), Metropolitan Museum of Art. Left: Bodhidharma crossing the Yangtze river on a reed by Dong Bangda (董邦達 1696－1769), Qing Dynasty officials, calligraphy and painting. Middle Left: Bodhidharma crossing the Yangtze river on a reed, Rubbing from original monument at Shaolin Temple. Ming Dynasty. Right: Bodhidharma crossing the Yangtze river by Sun Jihong (孙克弘 1533-1611), Ming Dynasty, 17th Century. Failing to make a favorable impression in Southern China, Bodhidharma is said to have travelled to the northern Chinese kingdom of Wei to the Shaolin Monastery. After being refused entry, he lived in a nearby cave, where he "faced a wall for nine years, not speaking for the entire time". The biographical tradition is littered with apocryphal tales about Bodhidharma's Life and circumstances. In one version of the story, he is said to have fallen asleep seven years into his nine years of wall-gazing. Becoming angry with himself, he cut off his eyelids to prevent it from happening again. According to the legend, as his eyelids hit the floor the first tea Plants sprang up; and thereafter tea would provide a stimulant to help keep students of Chán awake during Meditation. The most popular account relates that Bodhidharma was admitted into the Shaolin temple after nine years in the cave, wher he had taught for some time. Other versions report that he "passed away, seated upright"; or that he disappeared, leaving behind the Yi Jin Jing (a martial art manuscript); or that his legs atrophied after nine years of sitting, which is why Japanese Bodhidharma dolls have no legs. In one legend, Bodhidharma refused to teach until his would-be student, Dazu Huike, who had kept vigil for weeks in the deep snow outside of the Monastery, cut off his own left arm to demonstrate his sincerity to learn. These two men, or empty philosophizing? It's only a water-carved cave, after all. In angry frustration at being ignored. Through which a thousand monsters roar. The wall is both, suffering and ecstasy. Everything is now beyond his arm's reach. Dao Yu said, “The four elements are all empty. The Five Skandhas are without actual existence. Not a single Dharma can be grasped." Finally, Huike came forth, bowed deeply in Silence and stood up straight. Bodhidharma passed on the symbolic robe and bowl of Dharma succession to Huike and, some texts claim, a copy of The Lankavatara Sutra. Bodhidharma then either returned to India or died. 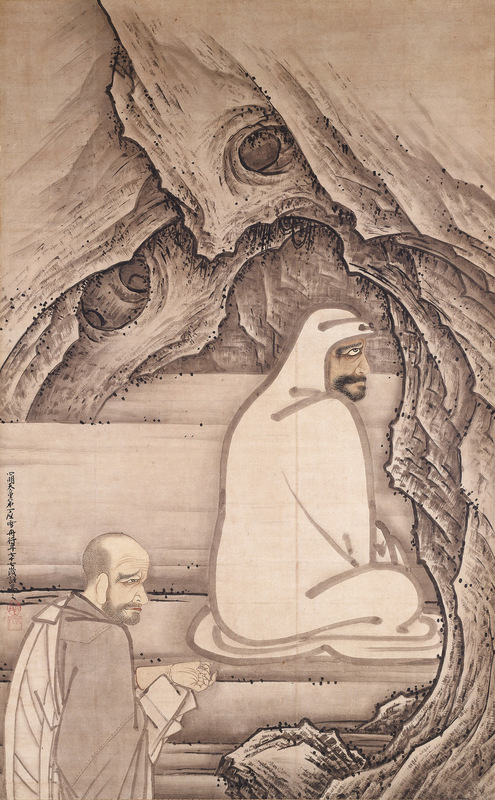 Left: Bodhidharma seated in meditation - Hanging scroll, Meiji era, ca. 1885, by Hashimoto Gahō 橋本雅邦 (1835 - 1908), Japan. Smithsonian Institution. Bodhidharma was the legendary Indian Buddhist monk who taught Zen Buddhist ideas to Chinese disciples, who then transmitted the teachings to Korea and Japan. The human and personal bonds of teacher and pupil were especially strong in Zen Buddhism, which encouraged each individual to seek enlightenment through practices such as meditation. 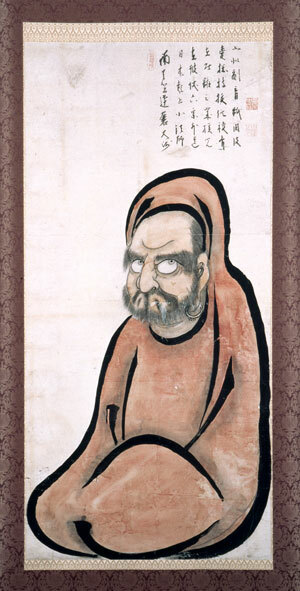 Japanese representations of Bodhidharma often portray him wearing a red monk's robe that covers his head. The cavelike setting recalls a story that he once sat in meditation for nine years facing a cliff at the Shaolin temple in China. Here the artist renders the patriarch with fierce features that express his spiritual strength and an aura of light around his head, often seen in Buddhist representations of deities. This mode of representation reflects the function of such portraits, which were often given by a Zen master to a pupil as a symbol of enlightenment or to commemorate the anniversary of Bodhidharma's death. Middle Top: Bodhidharma and Huike Huike asked to be accepted as disciple by standing in deep snow for weeks. He was ignored. 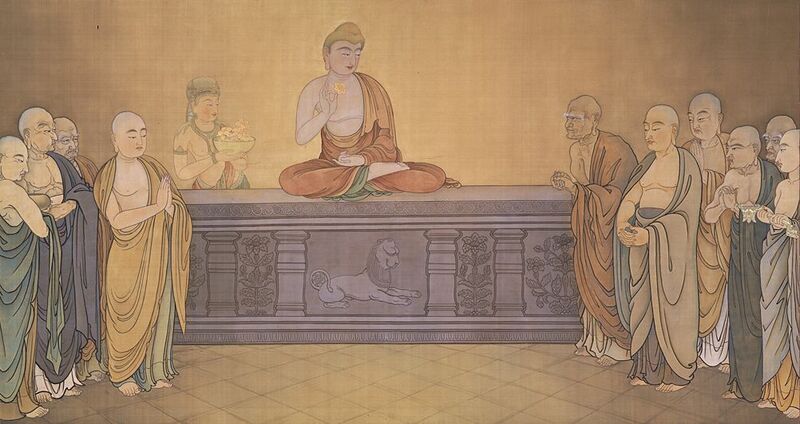 This painting depicts a famous anecdote of Zen Buddhism. When Bodhidharma, the first patriarch of Zen Buddhism, was meditating facing a rock wall in Shaolin Temple, the monk Huike came and asked to be accepted as his disciple. When Bodhidharma rejected the young priest, however, Huike chopped off his left arm to prove his firm determination to the master. He was then accepted as a disciple. The realistic facial expressions, the sharp eyes and the static composition give an atmosphere of tension to the scene. These depictions may suggest the advanced state of spiritual awareness that had been achieved by seventy-seven year old priest-artist Sesshu. According to the inscription on the back, this scroll was donated to Sainen-ji Temple by Saji Tamasada, the feudal lord of Miyayama castle in Chita County in the province of Owari (present-day Aichi Prefecture). It was given to the temple in 1532, shortly after Sesshu's death. 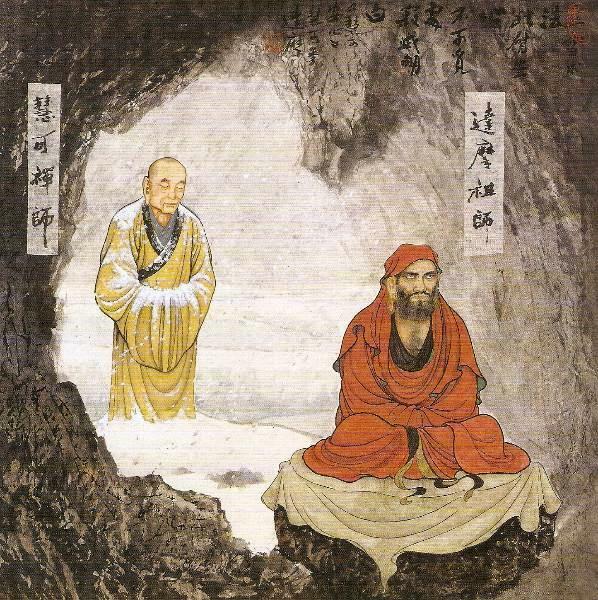 Bodhidharma is meditating inside a cave. Behind him stands a monk with a distorted face holding his own arm. The cut part of the arm is colored with single line of red ink, to express dripping blood. 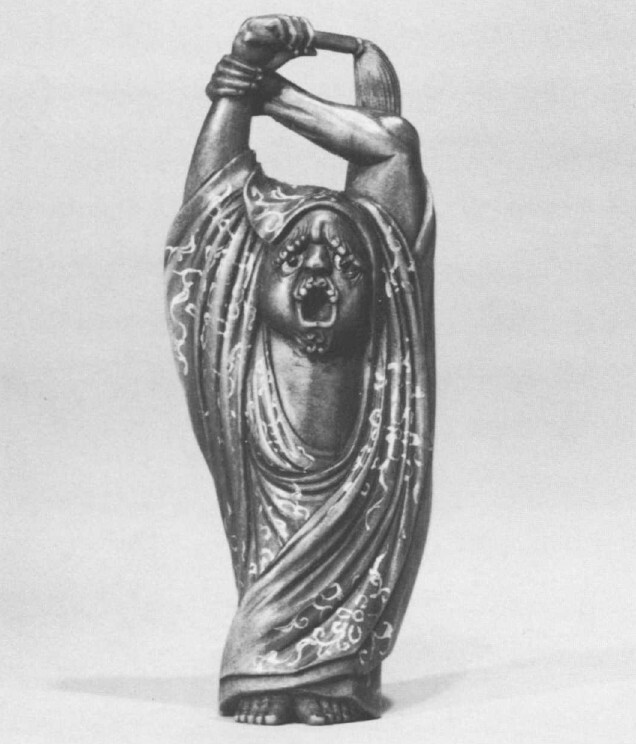 The monk, in order to show his determination to become a pupil of Bodhidharma, has cut off his own limb. This legendary scene is depicted in a masterpiece by Sesshū (1420–1506? ), painted when the artist was a still-productive 77 years of age. Right: Huike about to cut off his arm 慧可断臂慧圖 by Hakuin Ekaku 白隠慧鶴 (1685-1768), Edo era, 18 th century, Japan. This painting of Hakuin Ekaku was only receently discovered. First-time exhibition at Tokyo National Museum in Nov, 2016. 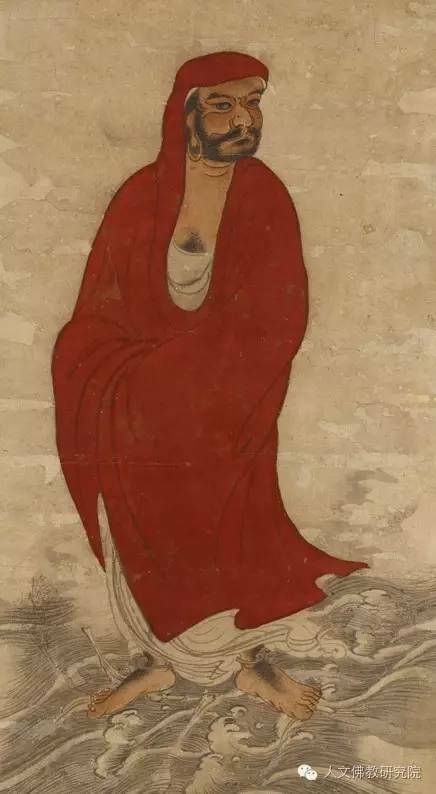 Tanlin, in the preface to "Two Entrances and Four Acts", and Daoxuan, in the "Further Biographies of Eminent Monks", mention a practice of Bodhidharma's termed "wall-gazing" (壁觀). Both Tanlin and Daoxuan associate this "wall-gazing" with "quieting [the] mind" (Chinese: 安心). Those who turn from delusion back to reality, who meditate on walls, the absence of self and other, the oneness of mortal and sage, and who remain unmoved even by scriptures are in complete and unspoken agreement with reason". In "Further Biographies of Eminent Monks", Daoxuan states, "The merits of Mahāyāna wall-gazing are the highest". These are the first mentions in the historical record of what may be a type of meditation being ascribed to Bodhidharma. Exactly what sort of practice Bodhidharma's "wall-gazing" was remains uncertain. Nearly all accounts have treated it either as an undefined variety of meditation, as Daoxuan and Dumoulin, or as a variety of seated meditation akin to the zazen (Chinese: 坐禪) that later became a defining characteristic of Chan. The latter interpretation is particularly common among those working from a Chan standpoint. There have also, however, been interpretations of "wall-gazing" as a non-meditative phenomenon. In the beginning, Dhyana Master Bodhidharma took the four-roll Laṅkā Sūtra, handed it over to Huike, and said: "When I examine the land of China, it is clear that there is only this sutra. If you rely on it to practice, you will be able to cross over the world." For all those who sat in meditation, Master Bodhi[dharma] also offered expositions of the main portions of the Laṅkāvatāra Sūtra, which are collected in a volume of twelve or thirteen pages […] bearing the title of "Teaching of [Bodhi-]Dharma". In other early texts, the school that would later become known as Chan Buddhism is sometimes referred to as the "Laṅkāvatāra school" (楞伽宗). The Laṅkāvatāra Sūtra, one of the Mahayana sutras, is a highly "difficult and obscure" text whose basic thrust is to emphasize "the inner enlightenment that does away with all duality and is raised above all distinctions". It is among the first and most important texts for East Asian Yogācāra. If, Mahamati, you say that because of the reality of words the objects are, this talk lacks in sense. Words are not known in all the Buddha-lands; words, Mahamati, are an artificial creation. In some Buddha-lands ideas are indicated by looking steadily, in others by gestures, in still others by a frown, by the movement of the eyes, by laughing, by yawning, or by the clearing of the throat, or by recollection, or by trembling. [The bodhisattva] will become thoroughly conversant with the noble truth of self-realization, will become a perfect master of his own mind, will conduct himself without effort, will be like a gem reflecting a variety of colours, will be able to assume the body of transformation, will be able to enter into the subtle minds of all beings, and, because of his firm belief in the truth of Mind-only, will, by gradually ascending the stages, become established in Buddhahood. Some Chinese accounts describe Bodhidharma as being disturbed by the poor physical shape of the Shaolin Monks, after which he instructed them in techniques to maintain their physical condition as well as teaching Meditation. He is said to have taught a series of external exercises called the Eighteen Arhat Hands (Shi-ba Lohan Shou) and an internal practice called the Sinew Metamorphosis Classic. In addition, after his departure from the temple, two manuscripts by Bodhidharma were said to be discovered inside the temple: the Yi-Jin Jing (易筋經 The Principle of Tendon-Alteration") and the Xi-Sui Jing. Copies and translations of the Yi-Jin Jing survive to the modern day. The Xi-Sui Jing has been lost. Historically, Bodhidharma is credited with inventing kung fu; however, this claim is unlikely because there are martial arts manuals that date back to at least the Han Dynasty (202 B.C.E.–220 C.E. ), predating both Bodhidharma and the Shaolin temple at which he stayed. The codification of the martial arts by monks most likely began with military personnel who retired to monasteries or sought sanctuary there. Traditionally Bodhidharma is credited as founder of the martial arts at the Shaolin Temple. However, martial arts historians have shown this legend stems from a 17th-century qigong manual known as the Yi-Jin Jing (易筋經 The Principle of Tendon-Alteration"). As for the "Yi-Jin Jing", a spurious text attributed to Bodhidharma and included in the legend of his transmitting martial arts at the temple, was in fact written in the Ming dynasty, in 1624, by the Daoist priest Zining of Mt. 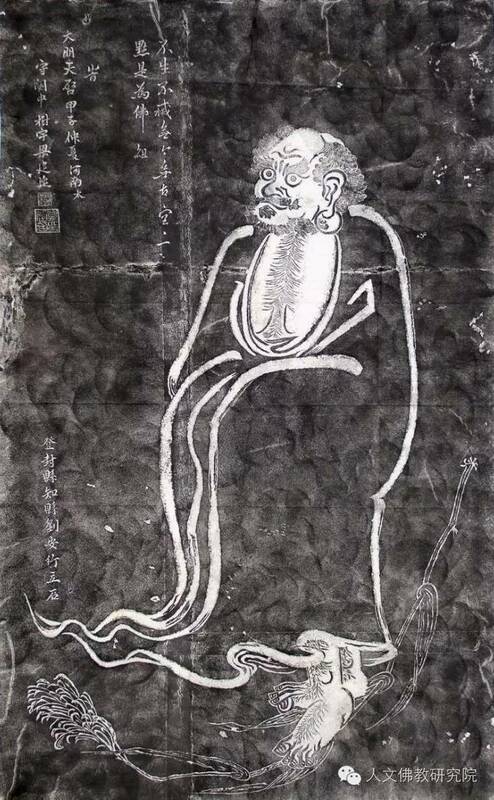 Tiantai, and falsely attributed to Bodhidharma. The prefaces. forged by the Tang general Li Jing and the Southern Song general Niu Gao, mention that, after Bodhidharma's wall-gazing for nine years at Shaolin temple, he left something behind in an iron chest; when the monks opened this chest they found two manuscripts within - "Xi-Sui Jing" (The Principle of Marrow Washing) and "Yi-Jin Jing" (The Principle of Tendon-Alteration"). The first book was taken by his disciple Huike, and disappeared; as for the second, "the monks selfishly coveted it, practicing the skills therein, falling into heterodox ways, and losing the correct purpose of cultivating the Real. The Shaolin monks have achieved fame for themselves through their fighting skill; this is all due to having obtained this manuscript." Based on this, Bodhidharma was claimed to be the ancestor of Shaolin martial arts. This manuscript, according to the historians, is full of errors, absurdities and fantastic claims; it cannot be taken as a legitimate source of Shaolin martial arts. One of the most recently invented and familiar of the Shaolin historical narratives is a story that claims that the Indian monk Bodhidharma, the supposed founder of Chinese Chan Buddhism, introduced boxing into the monastery as a form of exercise around a.d. 525. This story first appeared in a popular novel, The Travels of Lao T’san, published as a series in a literary magazine in 1907. This story was quickly picked up by others and spread rapidly through publication in a popular contemporary boxing manual, Secrets of Shaolin Boxing Methods, and the first Chinese physical culture history published in 1919. As a result, it has enjoyed vast oral circulation and is one of the most "sacred" of the narratives shared within Chinese and Chinese-derived martial arts. That this story is clearly a twentieth-century invention is confirmed by the writings going back at least 250 years earlier, which mention both Bodhidharma and martial arts but make no connection between the two. Three years after Bodhidharma's Death, Ambassador Song Yun of northern Wei was said to have seen him walking while holding a shoe at the Pamir Heights. Song Yun asked Bodhidharma where he was going, to which Bodhidharma replied "I am on my way back to India". When asked why he was holding his shoe, Bodhidharma answered "You will know when you reach Shaolin Monastery. Don't mention that you saw me or you will meet with disaster". After arriving at the palace, Song Yun nevertheless reported his encounter to the emperor. Since the emperor had been informed by Shaolin monks that Bodhidharma had died and been buried in a hill behind the temple. Song Yun was arrested for lying. At the Shaolin Temple, the emperor ordered Bodhidharma's grave to be opened. It was found empty except for one shoe. Carrying a shoe in hand he went home quietly, without ceremony. Middle Left: Sekiri Daruma (One Shoe Daruma 隻履達磨), by Hakuin Ekaku 白隠慧鶴 ? Middle Right: Sekiri Daruma (One Shoe Daruma) by Nagasawa Rosetsu 長澤蘆雪（ながさわろせつ）　1754～1799 天明6（1786）Paper book, Ink · tint color,　134.8×56.0, at Toyohashi City Museum of Art and History, Aichi Prefecture, Japan. Nagasawa Rosetsu was an 18th-century (Edo period) Japanese painter of the Maruyama School. One popular legend about Bodhidharma recounts how during his period of meditation for nine years near the Shaolin monastery he fell asleep, and when he awoke, he was so furious that he cut off his eyelids to avoid sleeping again during meditation practice. He then threw his eyelids behind him, where upon hitting the earth they allegedly sprouted into tea plants. In this manner, legend holds that Bodhidharma “brought” tea to China. However, a detailed description of tea-drinking is found in an ancient Chinese dictionary, noted by Kuo P'o in 350 C.E., almost two centuries before Bodhidharma came to China, and there is an early mention of tea being prepared by servants in a Chinese text of 50 B.C.E. Thus, it is likely that Chinese tea drinking predates the arrival of Bodhidharma. Daruma and Courtesan, by Katsukawa Shunkō 勝川春好（1743～1812). Details Here. Netsuke are miniature sculptures that were invented in 17th-century Japan to serve a practical function. These richly carved small toggles once used to attach pouches or cases to traditional Japanese garments. It evolved over time from being strictly utilitarian into objects of great artistic merit and an expression of extraordinary craftsmanship. Ivory, height 1.9 inches. Nineteenth century. Founder of the Ch'an (Zen in Japanese) sect of Buddhism in China, the Indian monk Bodhidharma, known in Japan as Daruma, traveled as a missionary from India to southern China about A.D. 520, but finding no welcome there, crossed the Yangtze River to settle in the north. 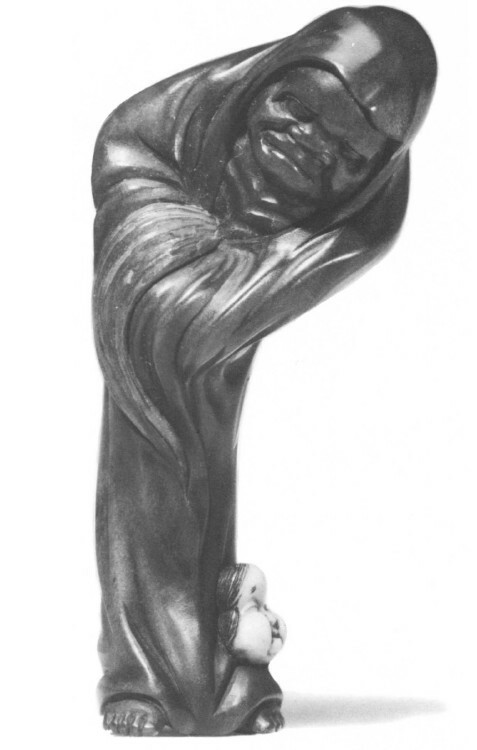 This netsuke depicts him crossing the river on a reed. 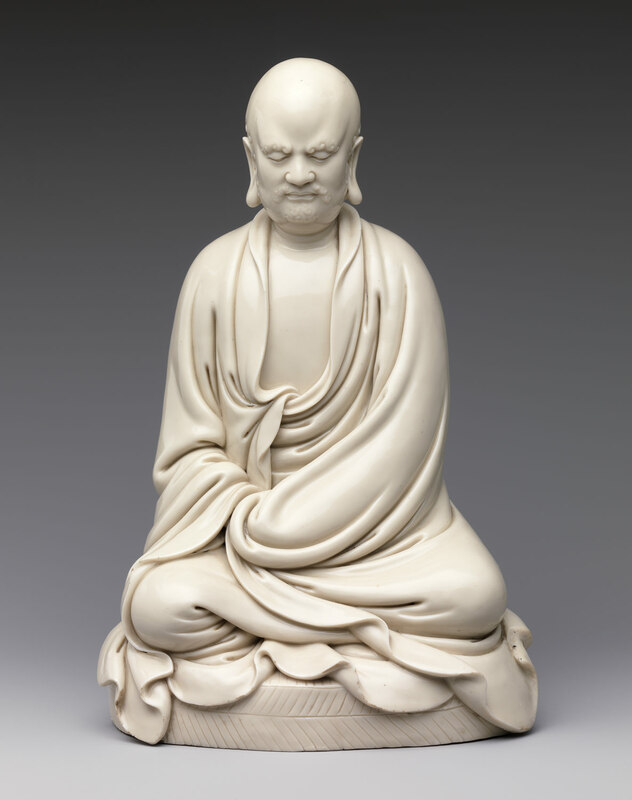 Bodhidharma, his robe folded over his hands, displays a stern countenance set in deep concentration. The rippling of the long robes suggests motion and also emphasizes the upright posture of the body, balanced precariously on the single reed and braced against the wind. Wood, height 3 'Is inches. Late eighteenth-early nineteenth century. Signed: Sensai to (literally, "Sensai's knife"). One legend concerning Daruma tells of his meditating for nine years facing the wall of a cave. During this period, he fell asleep and upon awakening, screamed in consternation because he had been unable to remain awake. Here, his rage is fondly reproduced. 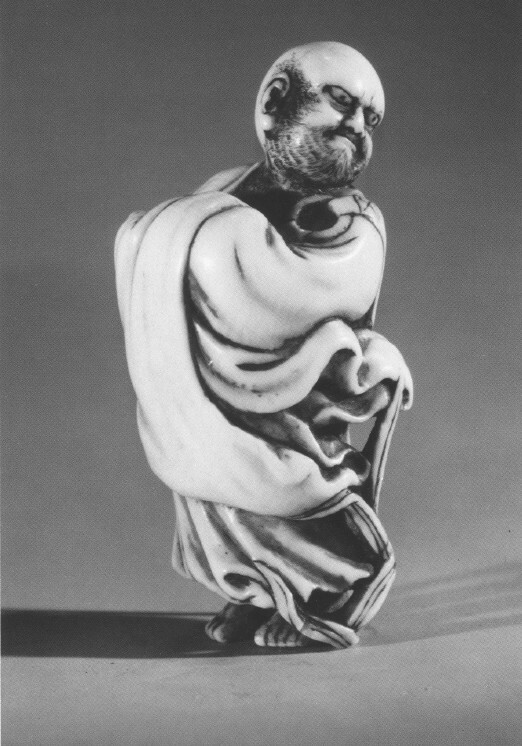 Although netsuke usually depict him beardless, this rendition gives him eyebrows, a moustache, and a short beard composed of small spiral curls, a form usually associated with the hair depicted on early sculptures of the Buddha. The eyes are sorrowful rather than angry and are marvelously expressive in their downward droop. The flow of the garment is simple, but the careful execution of feet and hands with sharply defined nails is an indication of the increasing emphasis on realism. Gold lacquer is applied for color. Wood with ivory insert, height 3 inches. Late nineteenth century. Signed: Sansho and a kakihan (stylized signature). 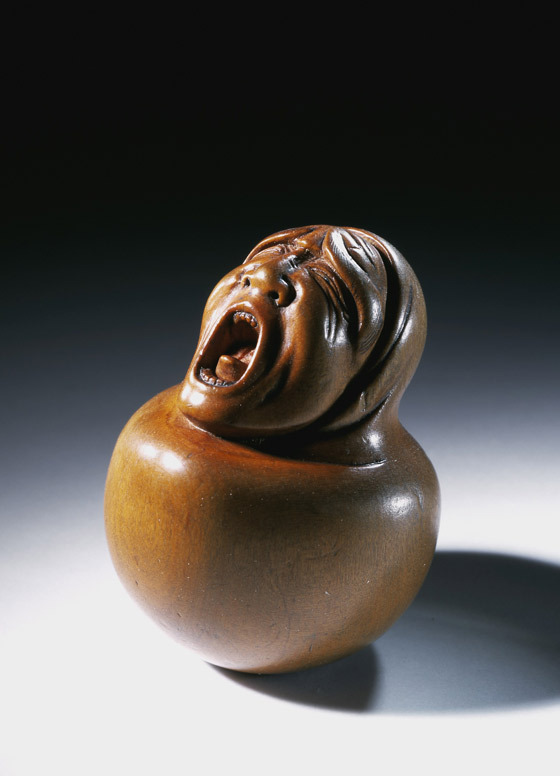 This netsuke alludes to the constant temptations that beset the celibate Daruma. Its satirical spirit is unmistakable. Many Buddhist priests, supposedly celibate, often visited geisha houses or had women brought to the temple, and netsuke artists often pointed out this hypocrisy. In most art forms of the Edo and later periods, Daruma is usually fondly ridiculed as being more human than legendary. The exaggerated scowl of Daruma's face, as well as the overextended curve of the figure as it bends first away from and then toward Okame, humorously expresses his dilemma. The artist Sansho (see also nos. 92 and 97) is known for his satiric representations of people and their follies. The composition is amusing and relates its message. The successful balancing of the figure is an artistic triumph. Netsuke in the shape of a daruma. One of the most popular charms in Japan, representing a Buddhist priest called Bodhidharma (Japanese name, Bodai Daruma), who was born in India in the 5th century. He introduced Zen meditation to China. People who meditate fold their legs under them and hold their arms close to the body - this explains why the doll has no arms or legs. The daruma developed its present form about 200 years ago. one of its best loved features is the shape, which makes it bounce back to an upright position after it is pushed over..
View original image: Reality is truth without words. 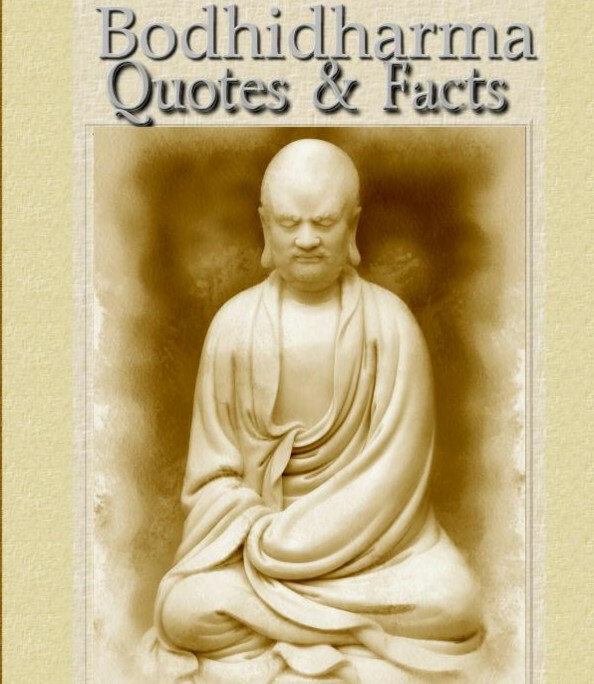 This book is an anthology of quotes from Bodhidharma and selected facts about Bodhidharma.